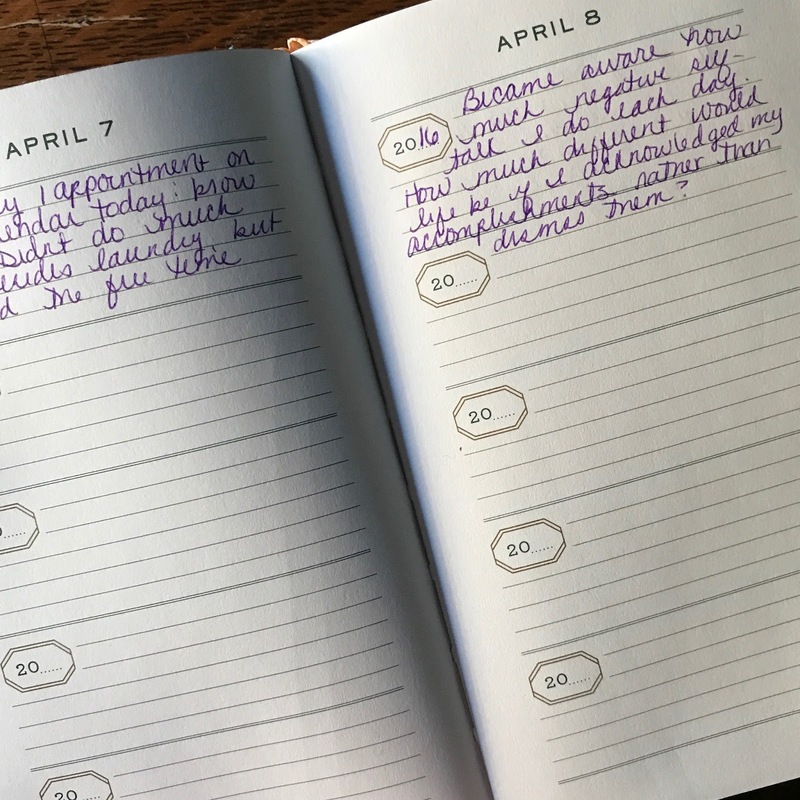 The past few posts have delved into longer, more emotional journaling methods – like the Spiritual Compass and Expressive Journaling. Today I thought I would showcase a short simple style of journaling: The Five Year Journal (also known as the line-a-day diary). For those who worry they don’t have the time for more extensive journaling, or fear they don’t have enough content to write about, I highly recommend starting with a Five Year Diary / Journal. These journals are structured like a typical diary, in that the book is 365 pages: one page for each day of the year. However, each page is also separated into five “annual” segments, equating to about 5-6 lines per year. Perfect space to write a one-or-two sentence summary of the day’s activities. Of course, there is no rule that states every line must be completed. The sole purpose of this type of journal is to maintain a brief daily record. While I have no problem writing paragraphs upon paragraphs each night, I too find value using this kind of journaling book. I enjoy re-reading the entries of the past (and reflecting on those memories) as I document the events of today. And two completed Five Year diaries provide a quick snapshot of a decade in your life – an indispensable record of family history. This sounds like an easy and quick way to do journaling. What a great idea for giving a glimpse into one's life. That would be such a treasure for future generations. Hi! I've always wanted to write s journal, but never really knew how to go about it. So happy to have come across your blog! I recently saw some five year journals. Previously I had seen people using index cards in a recipe box to create a multi-year journal. My daughter will complete her fifth year at the end of 2017. I am rather jealous of this keepsake you will have for years to come! Ooohh… I hadn't thought that life being too predictable could be a possible roadblock. I will have to give some thought as to how to combat that issue. I'd love to hear if you start – and how you like it! I could probably do a line-a-day. This could work. A five-year diary sounded daunting when I first read the words. But writing a sentence or two per day makes if more manageable, and enticing. Fast and easy writing. What a great idea! Thanks for sharing this. they do seem to be extinct, don't they 🙂 I wonder with the resurgence of analog planners, if these kinds of diaries will resurrect as well. I don't think I've seen one of these. I have a gardening journal that's turned into something like this but is much messier than a neat 5 years on a page. And my calendar journals tend to get used again and again for about 4-5 years but I seem to have months I write and many I don't. Great posts and theme.